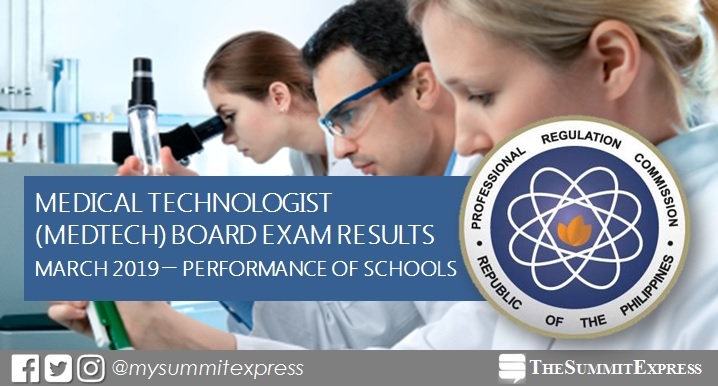 MANILA, Philippines – The Professional Regulation Commission (PRC) hailed the top performing schools in the March 2019 Medical Technologist (MedTech) board exam. PRC conducted the first board exam for medtech this year on March 13 and 14 in the cities of Manila, Baguio, Cagayan De Oro, Cebu, Davao, Iloilo, Tacloban, Tuguegarao and Zamboanga. In the same period last year, Adventist University of the Philippines (AUP) and Cagayan State University (CSU) - Andrews Campus were the no. 1 performing schools, both having 100%. Saint Louis University (SLU) ranked second with 99.34%. In the February 2017 exams, SLU, AUP and Far Eastern University (FEU) - Nicanor Reyes Medical Foundation led the schools with 100% passing rate. FEU-Manila followed with 95.59%.